I know it’s a cliche to call an issue pivotal, but that’s what Transformers Regeneration One #94 (out this Wednesday, August 28) is. A whole lot of stuff has been building, pressure cooker-style, to this point, and a whole lot more stuff (including the jaw-dropping issue #0) spins out of these 22-packed-pages. But – before I press on with this habitual discourse on the creative ins and outs of #94 – the usual warning: there be spoilers in what follows, though as always the aim is tantalise and tease rather than reveal huge plot points, so consider yourself warned. Right, so, here it is — the biggest most anticipated rematch in the whole of the core/original Transformers saga… Ultra Magnus versus Galvatron… that never happened before. Well, okay, it has if you’re Galvatron. Because, as we know, he’s from the alternative timeline established in issue #67’s Rhythms of Darkness, and he has fought UM before (the outcome of which you’ll get a flavour of in #0). But if you’re Ultra Magnus, this is the first time of asking and you’re very much in the dark. Are we sidestepping the UK clash between these two titans in the epochal Target: 2006? Yes we are. And no we’re not. I know, confusing right? Well let’s just say that anyone who’s conversant with that particular clash will see echoes of it here. ripples in what we now know to be a multifaceted prism of TF universes. But if you’re expecting a re-run of that clash, think again. Everything old is new again, right? That’s kind of RG1’s mantra. And the UM/Galvatron clash takes some very unexpected twists and turns. Are we content with just that? Heck no. There’s also an all-out assault on Cybertron by Bludgeon’s War World and Blitz Engines, a long-standing grudge match that edges closer to a denouement, and the beginning of a journey for Hot Rod that will have far reaching consequences, both for him and the future of the RG1-verse. Phew. Hope you enjoy this one, I certainly had great fun writing it. And Guido really knocks this one out of park! As usual, I welcome your comments/opinions in this thread. Off to Melksham Comic Con next weekend (Saturday August 31st), so if you’re in the west of the UK or just fancy a drive or train out into a very picturesque part of the Wiltshire countryside, pop along and say hi. I’ll be packing my usual fistful of signed/rare/nigh-on exclusive Transformers (and other)-related goodies and chatting to people throughout the day. 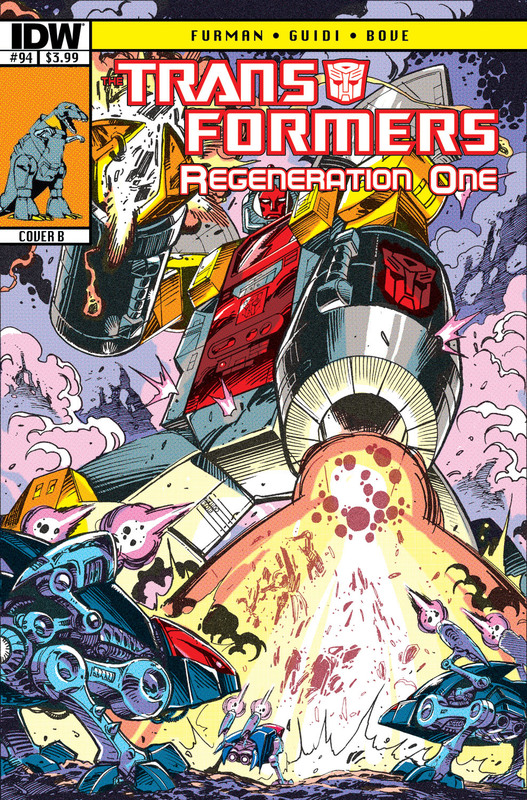 Transformers Regeneration One #94 (the BIG Ultra Magnus/Galvatron clash) will be out so you can get your copies of this sure-to-be-iconic (IMHO) issue signed by yours truly. Look forward to seeing some of you there. For more information on Melksham Comic Con check out their website here. Phew! A whole actual month (since LFCC) with no convention and now we plunge fully/headlong into the second half of my packed 2013 personal appearance schedule. We kick off this coming weekend with Auto Assembly 2013 (Aug 9th-11th), the UK’s (and Europe’s) biggest/premier Transformers fan event. This is a convention that just keeps getting better and better, and one I look forward to every year. Almost the whole Regeneration One team will be there – myself, Andrew Wildman, Stephen Baskerville, John-Paul Bove, Jason Cardy… and even a guest appearance on the Saturday from the one and only Geoff Senior! Only Guido’s missing, but this year AA welcomes none other than Alex Milne (More Then Meets the Eye) and Andrew Griffith (Robots in Disguise). Plus a veritable host of voice actors and other guests. There’ll be a special Regeneration One panel (with hints of upcoming stuff no doubt, including more on the mysterious issue #0), and I’ll have my usual fixed spot from where I’ll be signing. And, also as usual, I’ll have a bunch of stuff for sale, including four different RG1 script/comic packs and an enhanced Spotlight Shockwave signed script, which comes exclusively with Nick Roche’s Dynobot re-designs for the issue. Pre-registration for the event is now closed, but you can still buy tickets on the door. For details, check out the Auto Assembly site here. Hope to see you at AA or one of the above! You are currently browsing the simon furman blog archives for August, 2013.